I love puffy jackets. 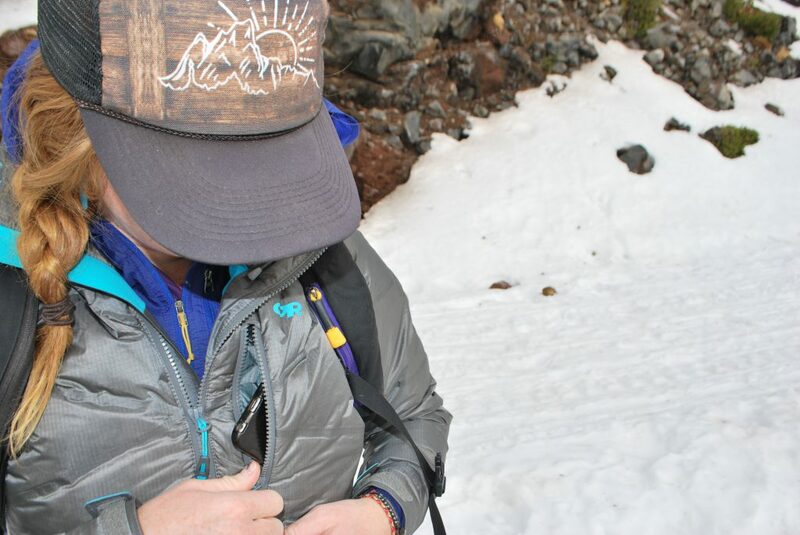 And so I was stoked to get the chance to review the Outdoor Research Floodlight Down Parka. This jacket is touted as being totally waterproof and windproof with 650 fill down. I put this jacket to the test in a variety of settings throughout the fall and early winter to see if it was as rad as they make it sound. I tested this jacket while on a snowy walk in the woods with my dog and boyfriend, I also tested it getting ready for chilly fall mountain bike rides, around town running errands and on a ski tour this fall. 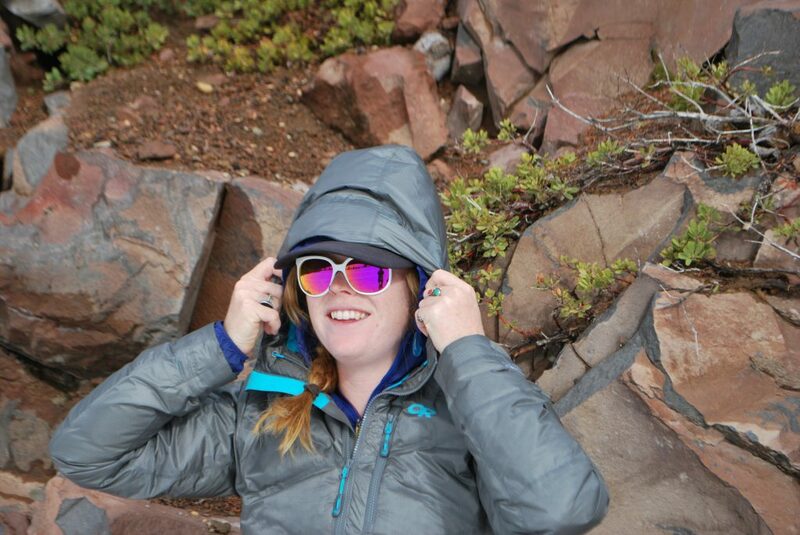 This jacket is said to be a good option for “cold weather athletes in harsh alpine environments.” That being said, it’s been a relatively mild fall and early winter here in Mount Shasta, California where I live and play, so I haven’t had the most ample opportunities to test it in harsh winter weather. This jacket is super cozy on a cold day and has a nice sleek look to it. It has two pretty good sized hand pockets and one chest pocket. I noticed the men’s version has a mesh inner pocket, which I would have liked to have had on the women’s version. This jacket is made waterproof through Pertex Shield+ 2L. This is the first piece of outerwear I’ve owned with this technology. I was initially skeptical, because GoreTex makes the most waterproof technology I’ve yet to encounter. I have been impressed though. I think one reason it’s actually waterproof is that there is no stitching on the outside of the jacket. This means there are less weak spots and no feathers getting free. Walking around town during a pretty rainy afternoon, all the rain beaded up and rolled off. My initial thoughts on this jacket were that I would most likely only wear it on storm skiing days at the ski park. One reason is that it’s a tad bulky, so I think I should have maybe gone for a size smaller. I am 5’8”, 145 lbs and have an athletic build, so I usually like to go with a medium in my ski jackets, so that I have enough room to layer for a cold, stormy day. That being said, it’s slightly longer and comes down past my hips, which I think will be a major pro for when the pow is waist deep. It’s also very warm, so I’ve often not needed to wear extra warm layers underneath. The hood is nice and big and has pull cords to make it fit tighter on your head or over a helmet. The arms are a tad longer, which I prefer so there’s length to tuck your ski gloves in. The main reason for my hesitation with taking this jacket on backcountry ski tours, is that it’s not an ideal layering piece. 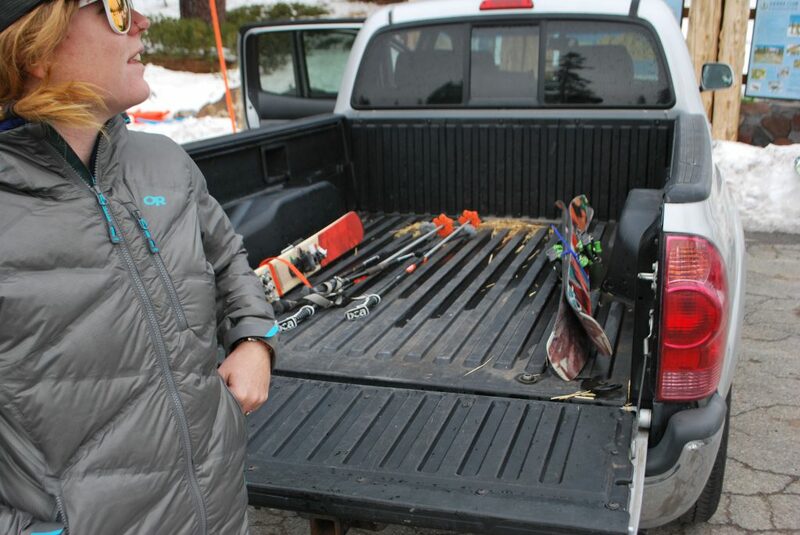 What I mean by that, is that I have my go-to layers for a ski day. Those include my base layer, possibly a mid-weight depending on temperature, a light weight shell for hiking in, a heavier shell for skiing in and then an insulating layer for the descent. These layers should work together as a nice cohesive unit. The Floodlight Parka is a bit too bulky to go under my shell and cannot be my only outer layer, mostly because then I lose my wind and weather protection when I take it off to skin for another lap. I did take it on a short tour one afternoon to see if it was something I would do more often. I came to the conclusion, that I probably wouldn’t take it touring when in the maritime climate because it’s just not that cold. I will be going on a pow chasing tour this winter throughout the US and Canadian intermountain and continental climates and will definitely bring it with me then. It’s so much colder in those climates and there will be more of a need for bigger layers. My final word on this jacket, is that it’s a great jacket. Overall, I think the pros far outweigh the cons. I will be stoked to throw this jacket on for cold, stormy days at the ski park. Shop the Outdoor Research Women’s Floodlight Down Parka on Outdoor Prolink. Not a member? Apply today! 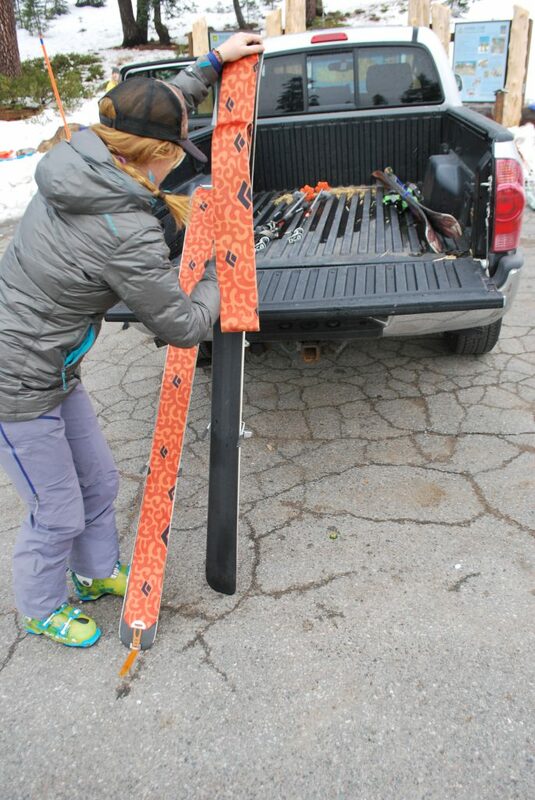 Dirtbag Dreamer, Alyssa Winkleman, has been skiing and adventuring her entire life. During college she realized she could get paid to do the things she loves and so she made her pastimes her work. Alyssa has been a professional ski patroller for 8 years at Mt Shasta Ski park, a river guide for 6 years and a mountain guide for 4 years in California and Oregon. Her bachelor’s degree is in Outdoor Adventure Leadership. When she’s not guiding or patrolling, she can be found skiing, riding her mountain bike or playing with her dog. Find her on Instagram @alyssawinks. Great review of the FL Jacket. I have owned this jacket for two years now and I totally agree with your entire assesment with one exception: it works pretty well as an outerlayer. I have found this jacket to substitute for an outerlayer in mild conditions and when it is really nasty out I can still fit my shell over it (I’ve only had to do it once, however). It is totally bulky and doesn’t always fit into my layering system but when it does it performs like none of my other pieces of gear can. If you can, size down and be choosy about when you pack this piece. That’s awesome to hear Jason! What type of weather are you mostly in? Great advice to size down! Hey Jason! Glad you liked this review! 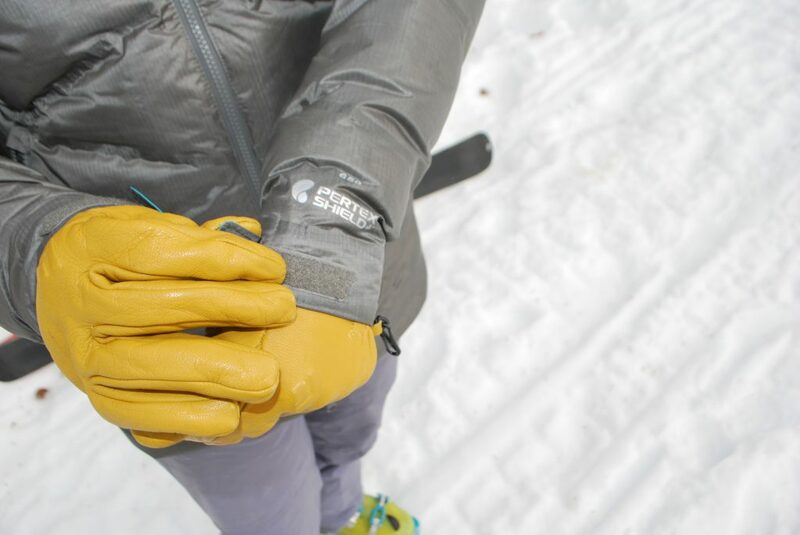 Our reviewer, Alyssa, also said it was a tad bulky for packing, definitely makes sense to think about your layering system when it comes to this jacket. Great advice about sizing down.Thanks for your pro tips!